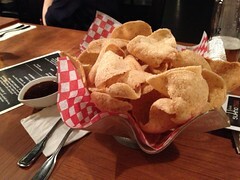 Chef Nuit has played a part in all of my favourite Thai restaurants in Toronto. 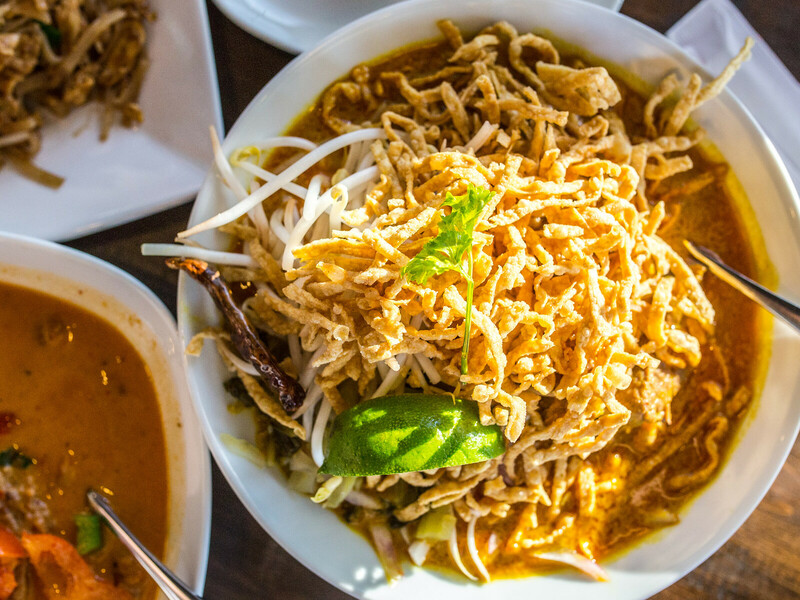 From Sukho Thai to Pai, I’ve lined up for her Khao Soi around town for years. When I heard about a new Thai restaurant opening in Scarborough, with an ex-chef from Khao San Road, I was eager to queue up closer to home. 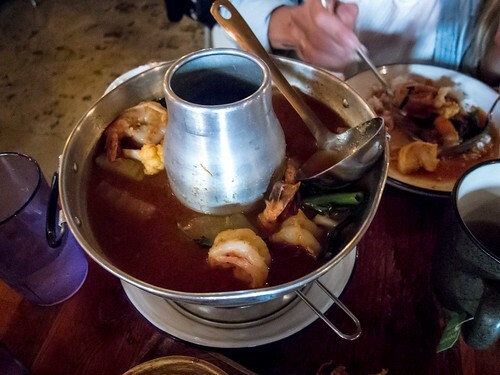 Atmosphere: Kub Khao was tiny, with 20 seats max. They typically don’t take reservations, but The Hubby somehow managed to reserve a table for 4 at 6:30pm. With the limited seating and most diners visiting to eat a full meal (aka not a fast churn rate), I would recommend visiting during off peak hours only or being prepared to grab take-out. One wall of the eatery was floor to ceiling glass, which meant when we visited at sunset and light streamed in, the seats facing west were blinded. The restaurant itself was cozy and compact with dark wood furniture and accents. Service: During our visit, there was one hostess seating guests and answering calls, and one server. With the small number of tables, I wouldn’t say the server was over capacity but she was busy. Also, half of the diners seemed familiar with the menu and the rest had lots of questions, which meant some tables needed far more attention than others. Service was on a more “as-needed” basis rather than preemptive. Our server was friendly and efficient, but inconsistent. We weren’t given the option to customize the spice level of any dis, while the table next to us were. A few wrinkles to iron out, but nothing earth shattering. 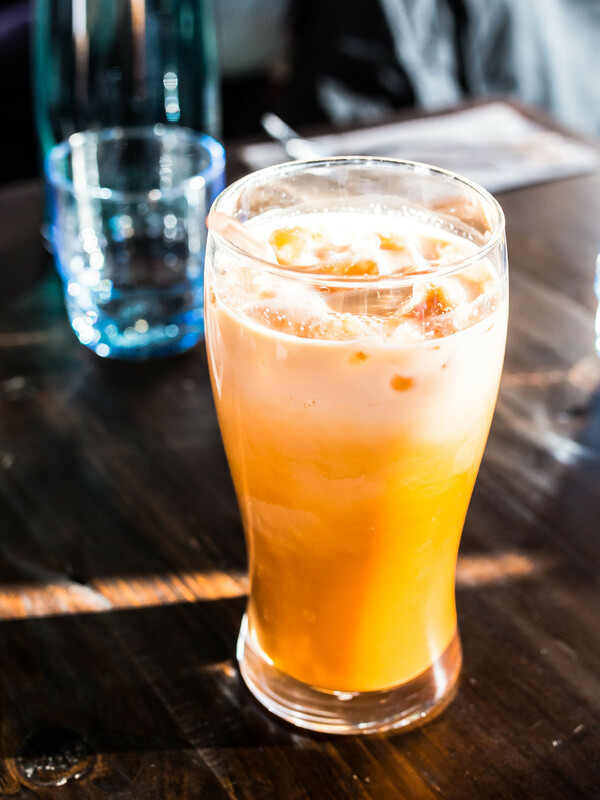 Food: No meal would be complete without a creamy, rich, Thai iced tea. The drink at Kub Khao was spot on with a good balance between sweetness and the bitter, strong tea. 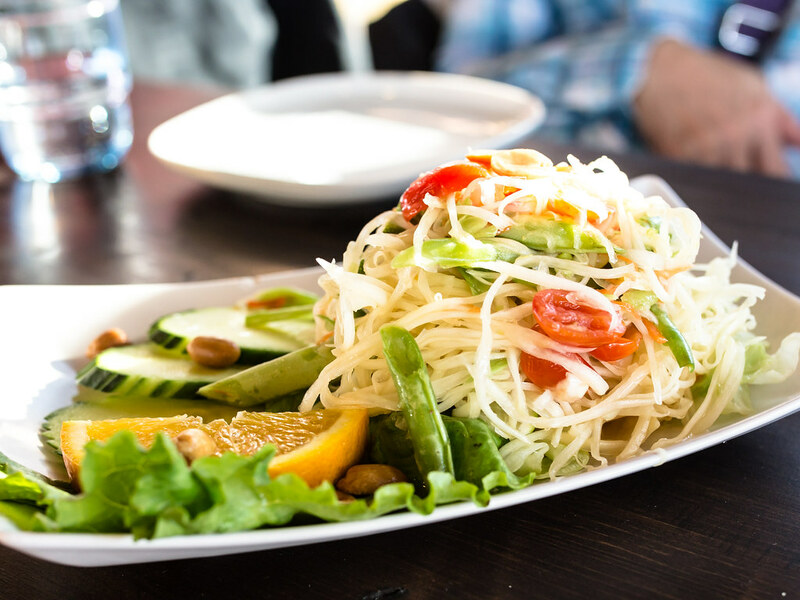 For an appetizer, I ordered the papaya salad, that was refreshing and very spicy. This was the hottest dish of the evening and being first, I was worried about the remainder of the meal. Fortunately, this was the peak. 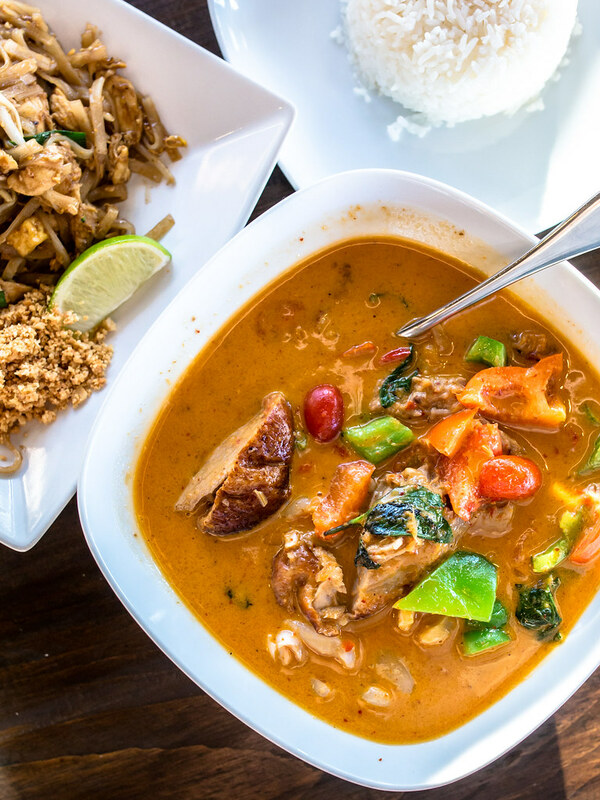 For mains, we ordered the Chicken Pad Thai, Roasted Duck Curry and Beef Khao Soi, with a side of coconut rice. 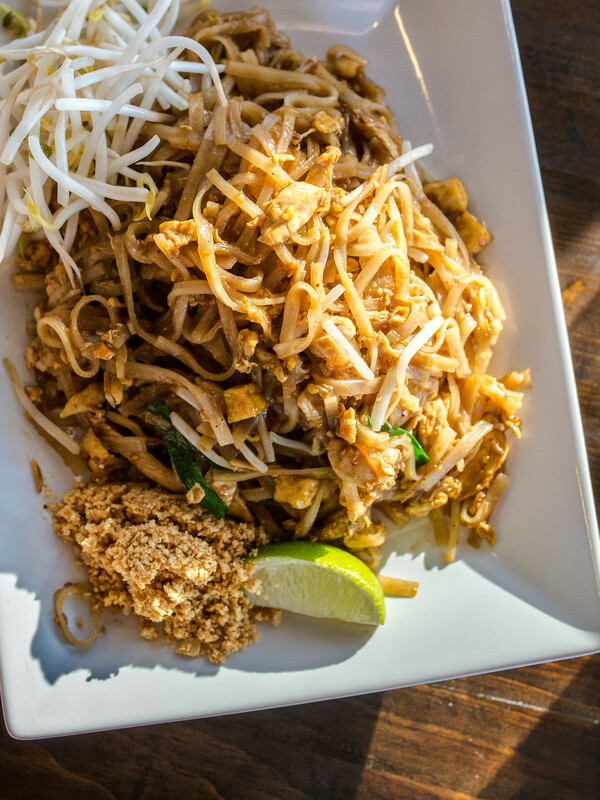 I really enjoyed the taste of the pad thai, which didn’t have a hint of ketchup. The noodles had a chewy texture, a touch of sweetness and strong nutty flavours. A touch more heat would’ve made the dish even better. 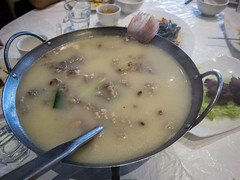 My favourite entree was the Duck Curry, that was savoury, spicy, coconutty and sweet from the lychee. No one fought over the pieces of roast duck, instead we all vied for the whole lychees, soaked in curry. The fruity flavour complimented the heat and spice of the dish perfectly. Another thing I loved about the curry was the strong aroma of basil. A bowl of steamed rice was served with the curry. Our order of coconut rice turned out to be a palm sized mound meant for one person. Although delicious, priced at $2.95, I’m unsure of the value. 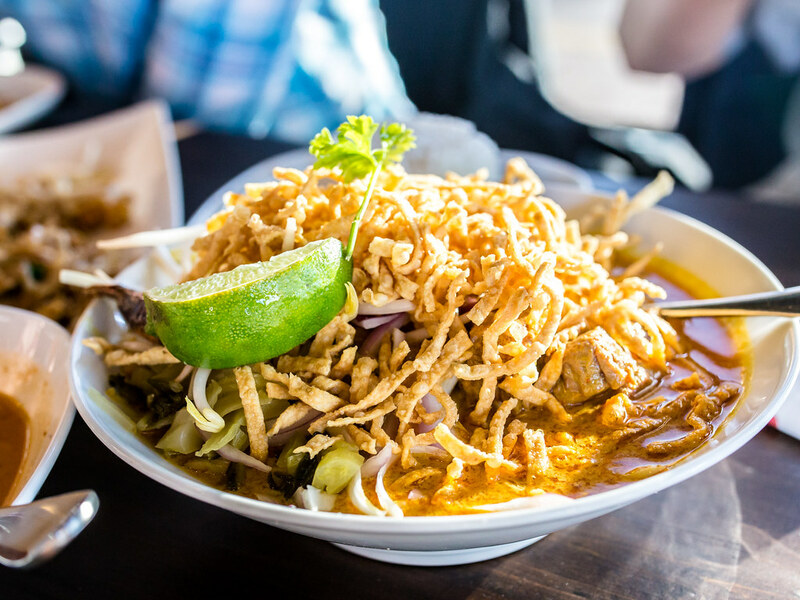 The Khao Soi from Kub Khao was rich and packed with rice noodles. Topped with crunchy egg noodles, each spoonful of the curry had a variety of textures and flavour. I did find this dish on the sweet side and again, would’ve liked a touch more heat. Relative to other Khao Soi dishes I’ve tried, this version was comparable. Overall, I see myself returning to Kub Khao often in the future. 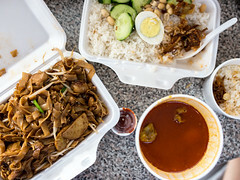 While enjoying a sit down meal at the small eatery may be challenging, I’m excited for the take-out and delivery options available.